B U B B L E G A R M: Ins and Outs! Mac Grand Duo msf in "Moon River" - This is my favourite highlighter & I have recently been showing it major love. Leather biker jackets - I am on a hunt! Experimenting with my hair colour?! My new leather fringe bag! Inspiring eye make up for my scrapbook. Breaking my digital camera and having to wait to get a new one! What's in and out for you? Those are some great beauty images also! Very inspiring. I remember when you posted the first pic on Twitter...i love it! hopping over to your scrapbook! i love biker jackets--can't wait to see the one that you find! that picture of chanel iman is really nice too....and processed food--you're right...yuk! thanks for ur comments girls..
@shirley yes, im still loving that photo, i need to try it out! @ashleigh oooo hair extensions are in as quickly as they are out for me :) im ALWAYS changing my mind! Now that the weather's starting to change, my cardigans are definitely in...lol. 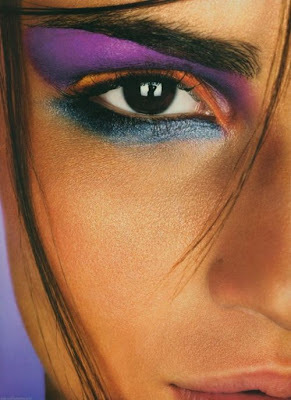 That eye makeup is jaw-dropping!